For Shapes of Knowledge, artist Lucas Ihlein presents a new project that builds on his long term research into agriculture. 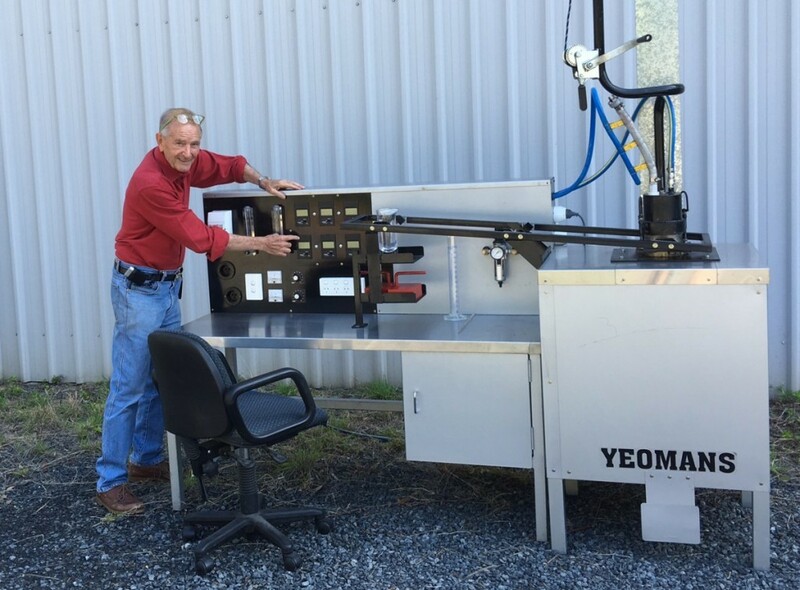 Ihlein’s project focuses on the Yeomans Carbon Still, a recent invention designed by Allan Yeomans to measure the carbon content of soils. The still is intended to be used by farmers as a means of quantifying the carbon sequestration performed through their agriculture practices. In a future carbon economy, farmers could be paid for drawing down carbon dioxide from the atmosphere through regenerative farming. According to Allan Yeomans, up until now soil carbon testing procedures have been complex and prohibitively expensive, meaning payments to farmers are cancelled out by the cost of carbon measuring itself. The Yeomans Carbon Still has slowly evolved into a very accurate device for measuring changes in soil carbon levels. It can now test individual samples weighing up to 2,000 grams with a 1 gram accuracy. In the Carbon Still an air flow, at a preselected temperature, passes directly through the sample material. Intermittent contact between soil and air seems thus assured. A complete test takes about 3 hours. In a future carbon economy, farmers must be paid for sequestering carbon from the atmosphere into their soils through regenerative agriculture - however there is much work to be done to create the technical, economic and governance systems to enable such financial incentives to be implemented. During the exhibition a working model of the Yeomans Carbon Still will be installed in MUMA galleries and used to test the carbon content of soils of various farms throughout regional Victoria. Excursions to collect the soil samples may involve Monash University students, scholars and members of the wider community and will double as opportunities for learning about regenerative farming processes more broadly. Alongside these material investigations, public discussions will take place in the gallery involving engineers, climate scientists and carbon farming advocates about the potential viability (economic, legal, botanical) of an agricultural approach to carbon sequestration. Wollongong-based artist and educator, Lucas Ihlein, holds learning at the very centre of his artistic practice, understanding his artworks (prints, film and text) as tools to satisfy his own desire to learn. Importantly, he opens up the processes of his learning so that the audience may also be present in knowledge production, as it unfolds rather than after-the-fact. Ihlein’s projects tend to explore the relationship between socially engaged art, agriculture and environmental management. He is a founding member of artists’ collectives SquatSpace, Big Fag Press, and Teaching and Learning Cinema. Major exhibitions include The Yeomans Project (with Ian Milliss), Art Gallery of New South Wales (2013-14); Green Bans Art Walk, The Cross Arts Projects & Big Fag Press, Sydney (2011); In the Balance: Art for a Changing World, Museum of Contemporary Art, Sydney (2010); There Goes the Neighbourhood, Performance Space, Sydney (2009); The Bon Scott Project, Fremantle Arts Centre, Perth (2008); and Bilateral, Australian Experimental Art Foundation, Adelaide (2002). In 2010 Lucas completed a practice-based research PhD at Deakin University entitled “Framing Everyday Experience: Blogging as Art”, which won the Alfred Deakin Medal for best Doctoral Thesis in Humanities and Social Sciences. In 2015 Ihlein was awarded an Australia Council for the Arts Fellowship for Emerging and Experimental Arts. He is currently an ARC DECRA Research Fellow at University of Wollongong, Australia. Allan Yeomans is the Managing Director of the Yeomans Plow Co, and author of the book PRIORITY ONE: Together We Can Beat Global Warming (2005). Allan’s main concern for the last 30 years has been the prevention of global warming and the halting of climate change. He sees this as the most urgent problem facing humanity this century. His invention of the Yeomans Carbon Still aims to contribute to the collective effort to draw down greenhouse gases from the atmosphere using agricultural soils as a carbon sink. In the mid-20th century, Allan worked with his father PA Yeomans on the development of the Keyline Design System for sustainable agriculture. Lucas Ihlein's project has been assisted by the Australian Government through the Australia Council, its arts funding and advisory body; the Australian Research Council (ARC); and the NSW Government through Create NSW. The project forms part of "An artist, a farmer, and a scientist walk into a bar..." co-ordinated by Kandos School of Cultural Adaptation (KSCA).